Kanagawa Prefecture (神奈川県, Kanagawa-ken) is a prefecture in the Kantō region of Japan on the island of Honshu. The capital city is Yokohama. Kanagawa was created from lands of Sagami Province and Musashi Province. In 1853, Commodore Matthew Perry landed at Kanagawa. In 1854, the Japanese-American Convention of Kanagawa opened Japanese ports to the United States. In 1923, the center of the Great Kantō earthquake was deep beneath Izu Ōshima Island in Sagami Bay. Kanagawa is in the southeastern corner of the Kantō Plain. 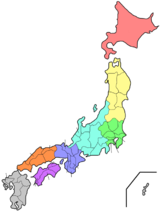 The prefecture is between Tokyo on the north, the foothills of Mount Fuji on the northwest, and the Sagami Bay and Tokyo Bay on the south and east. The western border is shared with Yamanashi Prefecture and Shizuoka Prefecture. National Parks are established in about 23% of the total land area of the prefecture. Samukawa jinja and Hikawa jinja are the chief Shinto shrines (ichinomiya) in the prefecture. ↑ Nussbaum, Louis-Frédéric. (2005). "Kanagawa" in Japan Encyclopedia, p. 466; "Kantō" at p. 479. ↑ Nussbaum, "Yokohama" at pp. 1054-1055. ↑ "Nationwide List of Ichinomiya," p. 2; retrieved 2012-3-14. This page was last changed on 31 August 2017, at 05:21.